Burnley face the best side they have played all season on Sunday, according to boss Sean Dyche. And he is hoping for a similar result! Back in October, the Clarets drew 0-0 with Manchester United at Old Trafford, on the back of a remarkable defensive display. Skipper Tom Heaton produced arguably the save of the season from Zlatan Ibrahimovic, as United had 37 shots – their most in a Premier League game since Opta records began in 2003-04. United come to Turf Moor on the back of a 2-0 win over leaders Chelsea on Sunday, but despite being on a 22-game unbeaten run in the league, they are not in the title race, and Dyche admits that shows how tough the Premier League is: “When I talk about the fine margins, it’s all the way through at this level. “United’s end of the market is different to ours, but they’ve been so dominant in so many games they probably should have won and haven’t. “They are a top side, you only have to look at the players they have, they are always going to be strong. “On the day at Old Trafford in October, they were the best sides we’ve played against this season. “They are strong in all areas, tactically and physically. While United’s display against Burnley impressed Dyche, his captain’s also stood out: “I think that’s, individually, up there with the best performances I’ve ever seen, particularly as a manager. “To do that against the very top end of the market...you need players to play well, some players to have very big games. “The save from Ibrahimovic in particular was as good as you will see. “He was brave, and he had that belief that he will save everything – save the unsaveables, that he has no right to save. “The top end have that – like his save from (Alvaro) Negredo at Middlesbrough the other week, and from Charlie (Austin) at Southampton. 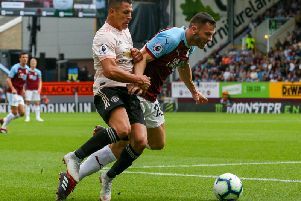 Heaton is one of three former United players who could face their old club, with Michael Keane and Robbie Brady, and Dyche believes their Old Trafford upbringing is unparalelled: “I don’t know the modern culture at United, but the ones we’ve got from there are from an era where they have a certain level of respect and discipline, that deep-down thinking. “A lot of them worked with Warren Joyce, and it’s been tough for him at Wigan, but it’s fantastic what he achieved at United with players’ development. “All the players I’ve worked with from United, Tom Cleverley, Danny Webber, Chris Eagles at Watford, Tom, Keano, Robbie Brady, they have a certain manner and a way – the best word is professional and reliable.